I get it when people complain about the kids’ sports culture that waters down the idea of competition by giving everyone a trophy just for “showing up.” Once Jesse’s basketball team literally finished dead last in a tournament and every kid got a medal to hang around his neck. He was appropriately horrified. 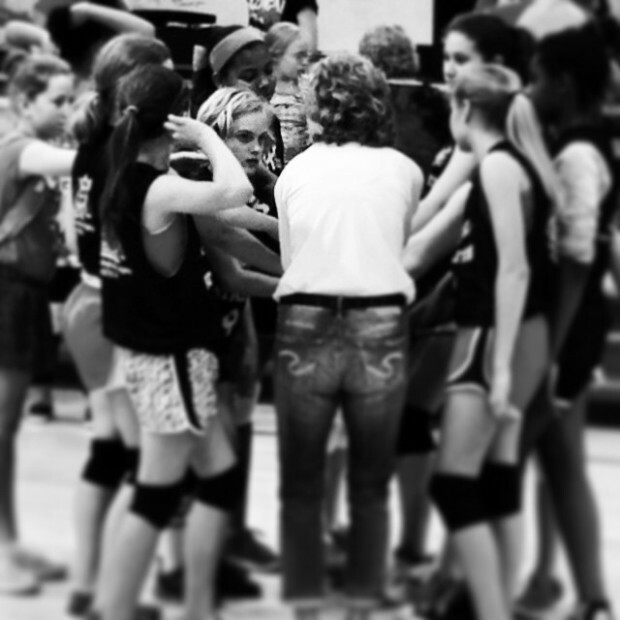 But I think my perspective has softened on that one a little bit, and here’s why: my sixth grade volleyball player. Claire is every inch the competitor Jesse is. Despite her physical limitations from cerebral palsy, she has taught herself to shoot and dribble a basketball. 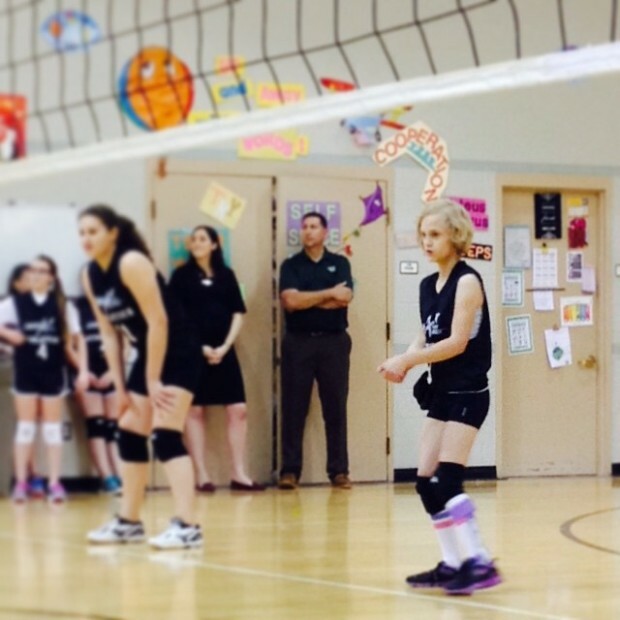 This winter when she found out her elementary school was offering girls’ volleyball, she decided to learn that game. She had never played before. Because of the weaknesses in her left hand, she basically plays with one hand. She taught herself to serve by tossing the ball with her right hand and then popping the ball with the same hand over the net (sometimes – when all the parts fall into place perfectly). She has a pretty great bump when she can get under it. We’re very proud. At first we weren’t even sure if she should play because it seemed to be making her nervous, but after a few practices she was pretty sure she could do it. Her coach (who also happens to be her principal) coaches her like anyone else, not just encouraging her but also challenging her to improve. Exactly what Claire wants and needs. A few games ago when Claire totally whiffed on her serve, she threw her hands over her head and started to cry. I watched from the sidelines debating whether to embrace the impulse to run to her or to wait and see how she pulled herself together. Within seconds her coach and two teammates were at her side. They patted her on the back as she walked to the sideline (in this game they were all subbing out after their serves). I looked over later to check on her and saw two of her teammates making her laugh. She was fine. She had what she needed. So I get it. It’s kind of crazy the way we do sports sometimes. And we might be really screwing these kids up. But, you know, for today, I’m just really happy we got to be here. I’m thankful there was a team that had a place for everyone, and even if we had lost all our games I’d have proudly displayed that participation medal with zero misgivings. I hope you can hear me cheering from the stands here. And crying, of course. So happy to see her doing this and for all the love and support she’s experiencing! She’s an amazing girl and I love her so much! So proud of her! She loves you, too, Grandma! Way to go Claire! Baseball players with one hand, swimmers with one leg, surfers with one arm. They all got good at a sport because someone gave them a chance to do it and the kids were willing to do the work through the initial hard phases of the process. Nothing is impossible. Thanks for the link, Carol! I’m going to share it with Claire (although she’ll probably read this herself before I get a chance). This is motherhood every moment of every day. I pretty much burst into tears (while reading) when she missed the serve and started to cry. Then I was so happy when we (because now I’m totally living vicariously through you as I read) didn’t run to her because that would have totally ruined the fact that her coach and teammates were there for her. Love this post, love that Claire. She will *never* stop teaching us, for goodness sake. Yes! This was the alternate title for this post, well, a version of this post that sort of morphed into what it is now: “We All Have a Special Needs Kid” – Because we do, really. Every kid is different and needs different supports and encouragements. Each one reacts differently than the next. We’re all special needs parents in the most basic sense of that term. Love the bit about 6th grade girls being wonderful friends. And that would totally preach!